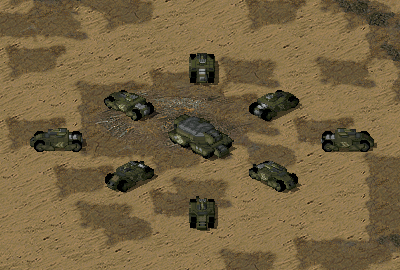 Forum index » Featured Projects » Tiberian Odyssey » G.D.I. The Prowler is the most common Forgotten vehicle. They have been seen operating for almost a decade, and it is likely that the design is adapted from something pre-Tiberium. These vehicles have more armour than most other ATVs of the same size, and the Prowler is armed with a distinctive high calibre machinegun. This gun is mounted on a high turret, giving it a very effective firing angle, and making it easier for the gunner to target hiding infantry. The gun is very efficient at killing infantry of all kinds at unparalleled speed and makes light work of small vehicles. The two man crews of these scouts are almost exclusively zealots, willing to give their lives for the cause. As a result many are killed early in their careers, but those who survive become incredibly good drivers. Veteran Prowler crews are vicious and unyielding because they become totally in tune with their vehicle - capable of squeezing a little more speed, manoeuvrability, firing speed to the already dangerous Prowler. The number of locations in which these Prowler ATVs have been spotted is climbing as the materials used to produce them become more obtainable and blueprints spread between the clans. Only time will tell what effect this has on the battlefield, and even then any clever commander could use these to their advantage. Your screenshots are always so dark. Its hard for me to see any details at all. Complete redo. Removed dark outlines, attempted de-smudging of the sides, changed remap positions.